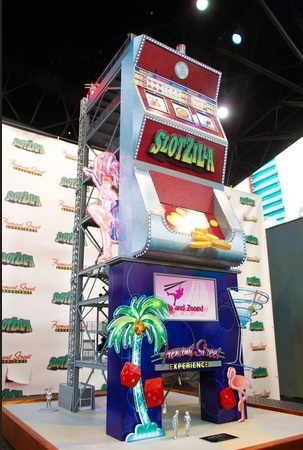 Love it or hate it, Slotzilla is becoming reality in Downtown Las Vegas. 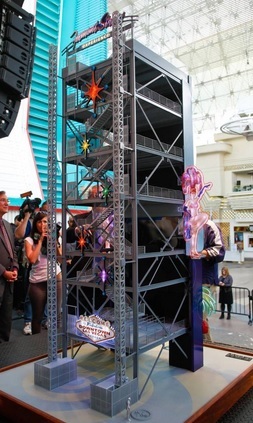 The 11 story structure will be the center piece to the Fremont Street Experience. The 11 million dollar project has received many complaints but mostly because of the hassle it has caused during its construction. The front side that looks like a slot machine will face the Fremont Street Canopy. The steel side or "ugly" side will face east Fremont Street and serve as the side You will climb up to launch Yourself. The launch will have two levels. One is 100 feet that will take the rider 1700 feet to the Golden Gate Casino. The lower level is 70 feet high which will take the rider 850 feet to the Fremont Casino. A lot has been made lately about the East Entertainment District that seems to be a little more snobby than most Downtown Vegas regulars are used to. This Slotzilla will be the dividing line of snobs versus regulars. If You want high priced food and drink and not have open containers as You walk then go east of Slotzilla in the Snob section. If You want to drink and walk and get cheap food and drink and free entertainment, stay west of Slotzilla under the canopy of the Fremont Street Experience.